Peter Island Resort, set on a 1,200 private island in the British Virgin Islands, is a luxury private island hideaway with only 52 rooms and two luxury villas offering privacy and seclusion to all hotel guests. The private island, covered with tropical vegetation, is surrounded by the waters of the Atlantic Ocean, Caribbean Sea, and Sir Francis Drake Channel. Located four miles south of Tortola, the resort is accessible only by boat or helicopter. Beach lovers should know that the island offers five private beaches: Deadman's Bay, Little Deadman's Bay, Big Reef Bay, White Bay and Honeymoon beach. The best snorkeling spot is White Bay, while Big Reef Bay is ideal for romantic sunset walks. The resort also features a freshwater swimming pool. The naturally protected lagoon and excellent berthing facilities make Peter Island one of the best places to visit by boat in the Caribbean. As a guest of the Marina, you get access to the island's spa, beaches, pools, restaurants and other facilities. Dock your private yacht or sailboat at the marina in Sprat Bay, directly across Drake’s Channel from Road Town, Tortola. The marina has 15 slips, four mooring balls and a 75’ T-dock. It can can accommodate yachts up to 170' long. It's a good idea to call ahead and book your space. Mooring balls are on a first-come, first-serve basis. Hourly dockage starts at $20. 10,000-square-foot Spa at Peter Island is a beautiful hideaway with 10 indoor treatment rooms, couples suites, a Jacuzzi and a relaxing garden. The spa is a separate facility with spectacular views of Big Reef Bay. Treatments to choose from include Ayurvedic treatments, massages, scrubs, wraps, facials, hair treatments, manicures and pedicures. After your treatment, stay a while and enjoy all of the amazing facilities, including the eucalyptus steam room, relaxation lounge and infinity pool. 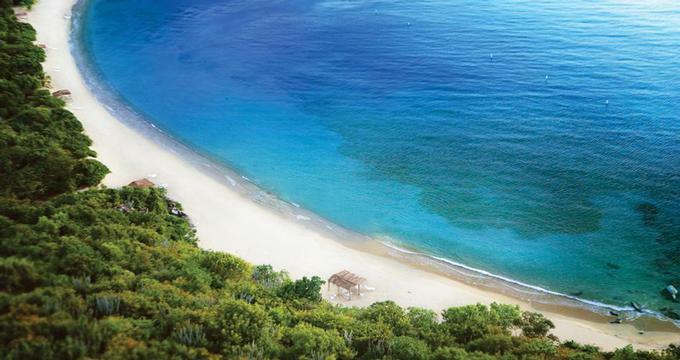 The resort offers a number of water sports, including snorkeling, wind surfing, sailing and kayaking. This island getaway has scenic hiking and biking trails, four tennis courts, a beachfront fitness center and freshwater pool. Additional off-shore activities can be arranged by the hotel, such as deep-sea fishing, scuba diving, golfing on St. Thomas or a day trip to The Baths, Virgin Gorda. The 32 Ocean View Rooms are housed in two-story poolside cottages. The 20 Beach Front Junior Suites have romantic Jacuzzi tubs, and a private terrace from which you can look out to Deadman's Bay Beach on your honeymoon. Hawk's Nest Villa offers two spacious bedrooms, each with their own bath, a living room, kitchen and private sundeck. Crow's Nest Villa, perched on top of a hill overlooking the Caribbean sea, has four bedrooms, five bathrooms, a wrap-around terrace and a private pool. The villa is equipped with its own staff: a steward, maid, gardener and chef. Crow's Nest Villa guests also have exclusive use of an island rover. Tradewinds restaurant serves West Indian dishes and Continental classics with an emphasis on fresh seafood and other produce available on the island. The restaurant, featuring large windows, overlooks Drake Channel giving vacationers a chance to enjoy open island views. Deadman's Beach Bar & Grill serves more casual dishes just steps from the beach. Guests dine surrounded by palms and seagrape trees. Drake's Channel Lounge is a bar with a shaded sitting area that serves a variety of tropical drinks. For those wanting to spend a full day on the beach, the hotel staff can deliver a gourmet picnic basket directly to the beach. Ocean View Room rates start from $530 USD May through October and from $840 January through April. Rates, subject to a 10% service charge and 7% government tax, include breakfast, lunch, dinner as well as most island activities. American Airlines services both San Juan and St. Thomas airports while Continental and TWA service San Juan. From San Juan or St. Thomas, fly to Tortola's Beef Island Airport. On Tuesdays and Saturdays, ferry service is also available from St. Thomas. Guests are met at Beef Island Airport by a resort representative and escorted to a private launch for a 25-minute cruise to Peter Island.